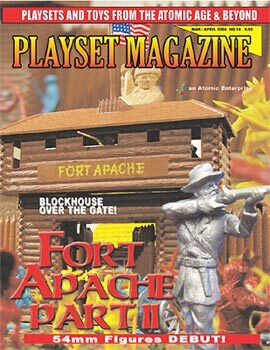 Issue 14 (Mar - Apr 2004): Ft. Apache Part 2! The overwhelming content of this issue focuses on the 1956 - 1959 Ft Apache sets that have given collectors such trouble over the years because they appeared during the 60mm to 54mm transition. We include MIB Contents -- from the smallest accessory to ALL the new 54mm figures -- for many sets from the basic 3680 to huge sets including Series 1000 and Series 5000! Plus: debut for an "Undocumented Ft Apache Cabin"